The best ever homemade hummus recipe that is so easy and healthy. Welcome to ultra creamy, fresh and fluffy hummus of your dreams. Learn a cool technique to give you that amazing hummus from your favorite middle eastern restaurant, right at home. Just like my fiery Muhammara (red pepper dip) and cool Mast O Khiar (yogurt cucumber salad). 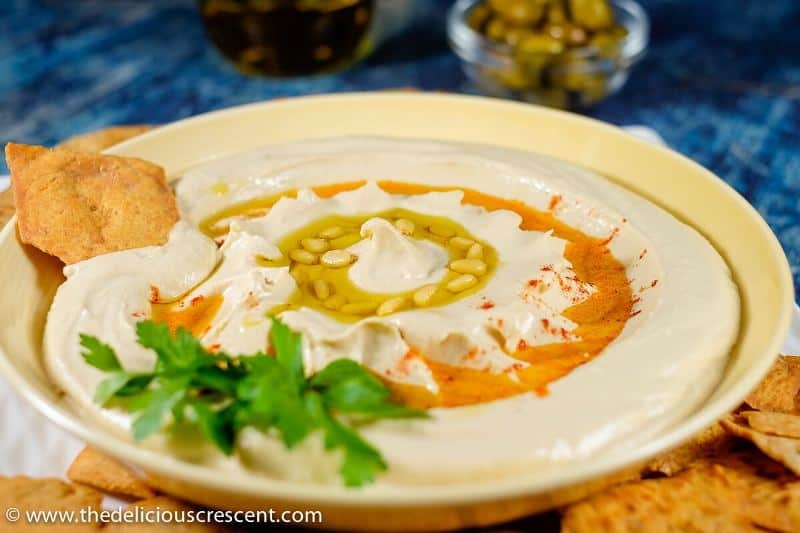 There are so many great hummus recipes out there, yet I always wondered about the ultra creamy, fluffy and pale colored hummus that you find in select authentic Middle Eastern or Mediterranean restaurants. I have spoken to traditional middle eastern cooks and researched recipes. I have taken inspiration from some outstanding hummus recipes by Michael Solomonov, Ottolenghi etc. And have gathered many secrets that I share here. Most recipes suggest peeling the chickpeas to make the hummus creamy. 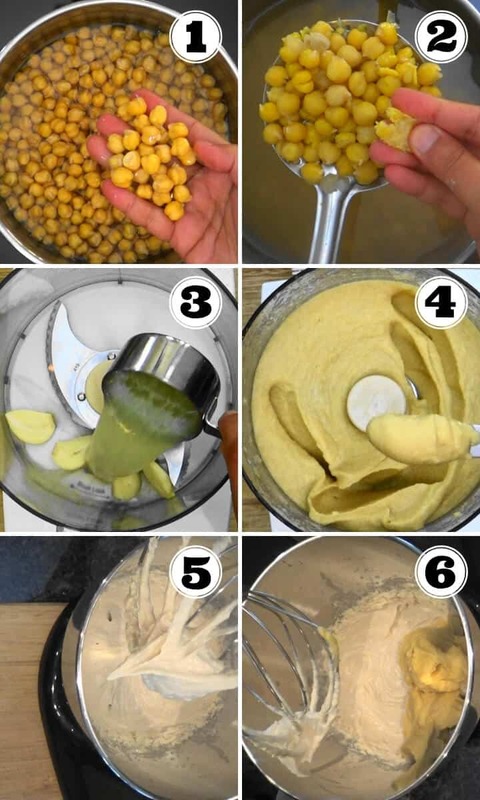 With the recipe here, you can use whole chickpeas also to make an ultra creamy hummus if you use a high speed food processor or blender, such as a Vitamix, and whip the tahini using a stand or hand mixer. The whipping of tahini and hummus incorporates some air and makes it light and fluffy. Chickpea seed coat has beneficial nutritional properties. It has more of the dietary fiber in the chickpeas, is an abundant source of polyphenolic antioxidants and the seed coat fiber has been found to be cancer protective. Therefore, this recipe shows you how to still get your creamy hummus with the seed coat! Made from scratch with dried chickpeas that are soaked overnight. Uses baking soda to soak and cook the chickpeas until they are soft and mushy. Hot cooked chickpeas are processed at high speed and long time. Tahini whipped at high speed with ice cold water and chilled garlic-lemon mixture until it becomes ultra creamy, fluffy and pale colored. Additional ingredients vary with recipes. Some use ingredients to enhance the creaminess, others to enhance or modify the flavor, such as herbs, peppers and other toppings. This outlines the steps to make the most creamy hummus ever. Cook chickpeas with lots of water and some baking soda, until quite mushy and falling apart. Tip: skim off any skins if you prefer. Process garlic with lemon juice and chill it. Process hot chickpeas at high speed and long time (2 to 3 minutes) until ultra smooth. Whip tahini at high speed using a stand mixer, along with ice cold water and chilled garlic-lemon mixture until fluffy and pale colored. Whisk processed chickpeas into the tahini mixture until ultra creamy. Garnish with extra virgin olive oil, pine nuts, parsley and paprika or sumac. 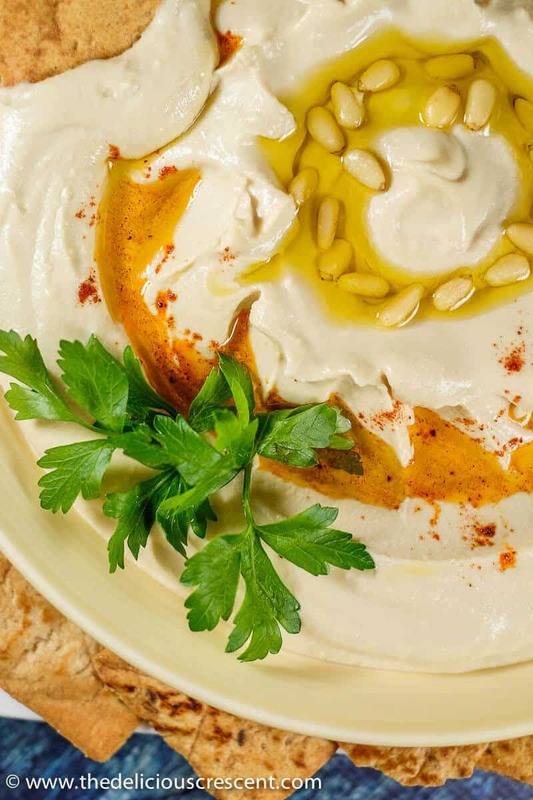 WHAT ARE THE NUTRITIONAL BENEFITS OF HUMMUS? 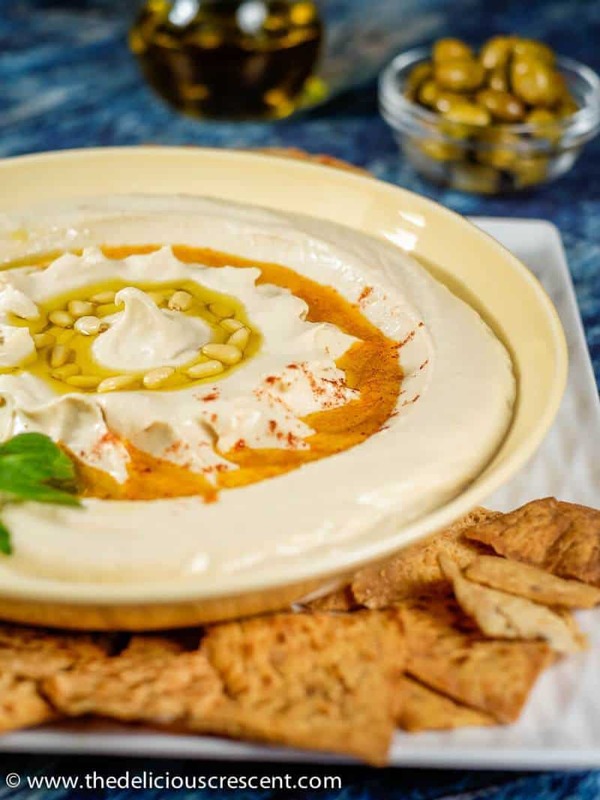 Hummus is a delicious and healthy dip packed with nutrients with many health benefits. Loaded with plant protein and other nutrients, such as folic acid, iron, phosphorus, manganese and B vitamins. Packed with dietary fiber that also helps with growth of healthy gut bacteria and production of short chain fatty acids, all of which promote intestinal health. It is a heart healthy food as it contains healthy fats, soluble fiber and antioxidant nutrients. Hummus is a good source of healthy fats, dietary fiber and protein, all of which having a moderating influence on the levels of blood sugar. In addition to that, chickpeas are a low glycemic index food, which get digested slowly, releasing sugars gradually as well. Great food choice for weight management. The fat, fiber and protein in hummus help with keeping one satisfied. And the slow digesting carbohydrates of chickpeas support that even further. An excellent source of antioxidant and anti-inflammatory nutrients from chickpeas, tahini and olive oil. 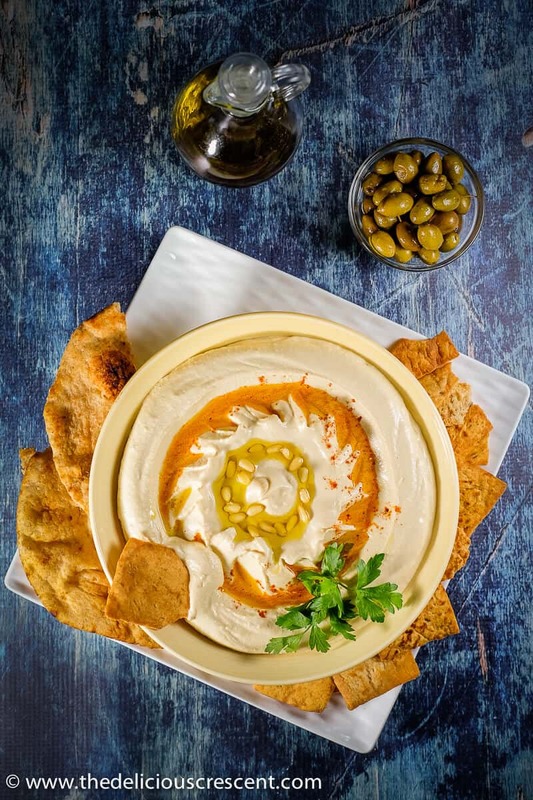 Hummus is gluten-free, nut-free and dairy-free, so it is especially suitable for those with allergies and intolerances. Baking Soda: Use some baking soda, both while soaking and cooking the chickpeas. The higher pH will help break down the chickpeas and cook them well. Make sure not to use too much, or the chickpeas will lose flavor and taste like soap! Soft Overcooked Chickpeas: Cook the chickpeas until very soft, mushy and falling apart. Skim off any skins if you prefer. Process Chickpeas when hot and for long time. That will help grind it real smooth and fine. Ice-cold and chilled: Use ice cold water and chill the garlic-lemon mixture. Fresh garlic and lemon juice: Blend these two well at first and let it chill. High Quality Tahini: This is one of the key factors. Tahini should be silky smooth with pouring consistency, not thick. Some of the best tahini comes from Lebanon, Palestine, Israel etc. I used Al-Wadi brand. Extra Virgin Olive Oil for topping. Homemade hummus lasts well for 3 to 5 days. You can freeze it up to 6 months. Make sure to whip it up a little after thawing. And freshen it up with lemon juice, some olive oil, fresh herbs and such. Soak the dried chickpeas overnight in water. Stir in 1/4 teaspoon baking soda and make sure to soak with enough water, such that it is 3 to 4 inches above the chickpeas. Drain and rinse the chickpeas. Transfer to a large cooking pot and add water covering 4 to 5 inches above the chickpeas. Add 1/4 teaspoon baking soda. Bring it to a boil and let it simmer until quite mushy and falling apart. Skim off any foam while cooking the chickpeas. Meanwhile, process the peeled garlic cloves with fresh lemon juice as fine as possible. Pass it through a fine mesh sieve to separate any coarse solids and chill the garlic lemon mixture. Drain the well done chickpeas when still hot, skimming off any skins if you prefer. Transfer the hot chickpeas to the same food processor and add few tablespoons hot water and process it for 2 to 3 minutes until ultra smooth. You can add the ground cumin in this step, if you wish to use it. Tip: Be careful not to use more water than necessary. Take 1 cup tahini, chilled garlic lemon mixture and salt in the stand mixer. Using the whisk attachment, combine the ingredients at low speed. Then add 1/3 cup ice cold water and whisk the mixture, increasing the speed gradually until it produces stiff peaks and becomes increasingly pale. Add the finely processed chickpeas in batches and whisk it into the tahini mixture. Whip the hummus, gradually increasing the speed until it is ultra creamy and fluffy. Adjust the salt to your taste. Transfer the ultra creamy homemade hummus to a serving bowl. Garnish with a drizzle of extra virgin olive oil, pine nuts, parsley and paprika or sumac. Serve it at room temperature with pita chips, flat bread or as a side. Store the leftovers in the refrigerator and thaw before serving again. Add water as needed while processing the chickpeas. Otherwise the hummus will become too thin. Using baking soda while soaking and cooking helps soften the chickpeas. But do not use too much of it or you will notice an off taste from the baking soda. If you have a powerful food processor or a high speed blender such as Vitamix, I would try retaining the chickpea skin. Otherwise, ultra smooth hummus is often achieved by removing the skin. Processing the chickpeas while still hot, along with hot water, will make it more smooth. Using chilled garlic lemon mixture and chilled water with the tahini will help with whipping it into a fluffy and pale mixture. The greatest secret is to use tahini of the highest quality! See blog post for more detail on that. Thanks Chris. I hope you enjoy making it. I found the whipping method to add to the creaminess. You really can’t beat homemade hummus, it’s one of my all time favourite things to make! I love homemade hummus, This recipe sure does sound Delicious! Everything is always better homemade! Thanks. Absolutely homemade is special. I love hummus and make it quite a lot at home. Looks so delicious! This looks so creamy I might just drink it from a straw! I will dream of this recipe tonight!